In honor of Veterans Day, here’s a reprise of a post I wrote four years ago. Thank you, Dad, for your service to our country, and for being the amazing father that you were. My father died this past Christmas. Yesterday was his birthday. He would have been 89. My Dad was a man of great intelligence and corny jokes. As an engineer of precision gauges, he had a PhD mind and a high school diploma. He was a true war hero; he fought in the Battle of The Bulge during World War II. And although he was proud of his service and loved the army, he hardly ever mentioned the two purple hearts that were stored in the attic. He was good-looking, and I think in his younger days, he was well aware of it. (I look just like him. But that’s not bragging; handsomeness in a man doesn’t necessarily translate to female beauty.) He was perpetually cheerful. He woke up happy. I never heard him swear, and what is more amazing still–I never in my whole life heard him speak an unkind word about anyone. On Father’s Day a few years ago, after two martinis, he said that having children was the best thing he ever did. But my father gave me a few words of advice too. Very practical advice. – “When you drive at night, keep your eyes on the shoulder of the road. You’ll stay in your lane, and you won’t be blinded by the oncoming cars.” Thirty-eight years later, I still drive this way. It works. – “If you need a really big favor, go right to the top. People with only a little bit of power are often stingy with it. People with lots of power don’t have anything to prove. They can afford to be generous.” Just try this next time you need a week off to help a family member, or an after-hours delivery. It’s amazing. Although I have a million memories, I have only one story about my father to share. I only need one, because it tells you everything you need to know about him, about my mother, about the home I was raised in, and the marriage I was privileged to have as an example. About thirty years ago, I lived in an apartment with terrible and expensive laundry facilities. So even though I was no kid, I still drove to my parents’ house every other Sunday with a basket full of laundry. Earlier that week, it had been my parents’ wedding anniversary. It may have been their thirty-fifth. My Dad told me that they had gone out to dinner to celebrate. Still single at thirty, I had yet to find a man I could stand for very long, never mind marry, and thirty-five years seemed like forever. He smiled, and his whole face lit up with pleasure. I remember this post from way back — I think it might have been one of the first of yours that I read. And it is well worth reading again. Thanks. And thank you to your dad. Lovely post, thank you for sharing. My Dad also fought in WWII. He was a Luxembourger and fought with the Belgian forces. He died when I was six, so I didn’t have the chance to ask him much about it. God bless all fathers and mothers, living and deceased, today and every day. Thank you. And thank all those who have to endure the tragedy of war. My dad has been gone for 7 years, but I miss him every day. He served two terms in WWII and was a closet post depression person. His stint in the war defined him as a person, as a man, and I miss that trait about him. About the world. Thank you for the post. We will always miss our dads. My dad was a WWII vet as well, he’s been gone 4 years now, would be 90 if he were still here. Never talked about the war much even when asked until his final years. It was then I finally realized how much what he experienced and witnessed had really effected his life afterwards. He would get quite emotional about the friends he lost and the ones he couldn’t save. Bless you dad and all the other vets who have lived out their lives with the trauma and tragedy stored in their minds, stood against eveil so we your children, your grand children could have better and free from evil lives. It overwhelms me when I think about what he was asked to do – and did so bravely – when he was only just a kid. He is truly a hero. Thank you so much. My dad with permission from his mother enlisted when he was only 17. Thanks for bringing me back to read this again. Loved it the first time and love it more today. Thanks for the story about your dad. I really didn’t get to know him until those last years. When we were growing up, dad’s worked (mine 2 jobs) and us neighborhood kids knew the moms more than the dads. Tom & Steffie used to be at the Fiddler Nights when I took dad and loved listening to them tell of the “old” days. 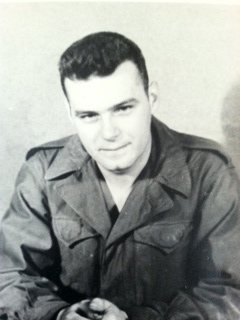 My dad (gone 3 years and would be 95 now) never talked of his war years until after mom passed away in 2001. When as children we would ask questions he always talked of the funny and light hearted things he experienced. He always said, those young men that served their country just wanted to come home, start their families and get on with life. In his later years he talked to us kids and grandkids about many “not so funny things”. He served in France and Germany and was wounded in the leg and he carried that srhapnell for many years. Amazed at the pain he felt with never a complaint. These men were truly the “Greatest Generation”. Dad suffered from dementia in the last 10 years but he could tell you every guy he served with and where they were from. I am thankful for veterans service and for every moment I had dad in my life. Like you Nancy, he was the SMARTEST person I knew. Yes, my Dad often loved to tell funny stories about his time overseas – did not like to talk about the horrors he surely witnessed – but those two purple heart in the attic tell the story. You are also right that we knew our mothers much better because our fathers were just striving to put food on the table, but I knew your father as kind and generous. It’s so nice to read about your dad: about his service to our country and what a special family man he was. I know you treasure your memories of him. I do – he was the kind of person I am still aspiring to be. This brought tears of happiness to my eyes. Thank you for sharing. I am happy to share my love for that kind man. Still a great tribute, and it reminds me of my dad. He was in the RAF at Mildenhall (England) during the war. Didn’t talk much about it either. Your dad sounds like such a lovely person. Thanks for sharing him with us today, and yes, he was a handsome man and also a good person. I found your blog via Jenny Lawson’s page. I’ve recently created a blog myself but I’m only a few posts in. I didn’t really read blogs until I discovered The Bloggess but now I’m really enjoying them. I liked this post of yours, I love to hear happy dad stories. My favorite one is Kelly Corrigan’s book “The Middle Place” Anyway, just wanted to say hi and thanks for sharing. Thanks. I love the Bloggess too!